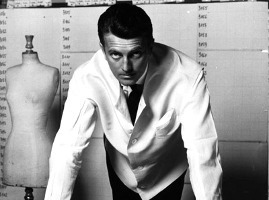 Fashion design house founded in 1952 by Count Hubert James Marcel Taffin de Givenchy, who had worked previously under Jacques Fath, Robert Piguet and Lucien Lelong, among others, although he frequently said that his true mentor was Cristobal Balenciaga. In 1953, Givenchy met Audrey Hepburn; she became his friend and muse and made his fashions world famous; other well-known clients included Jackie Kennedy and Grace Kelly. Givenchy sold his fashion house to Louis Vuitton Moët Hennessy in 1988, and retired in 1995; he passed away in 2018. He was succeeded by John Galliano, who was followed by Alexander McQueen, Julien MacDonald, Ozwald Boateng, Riccardo Tisci; Clare Waight Keller is currently creative director at the house of Givenchy. Fragrances include Le De Givenchy (1957), L'Interdit (inspired by Audrey Hepburn, 1957), Givenchy III (1970), Givenchy Gentleman (1974), Eau de Givenchy (1980), Ysatis (1984), Amarige (1991), Organza (1996), Organza Indecence (1999), Hot Couture (2000), Eau Torride (2003), Very Irresistible (2003). Fragrances for men include Monsieur de Givenchy (1959), Xeryus (1986), Pi (1999), Givenchy Pour Homme (2002) and Very Irresistible for men (2005). In 2005, Givenchy introduced a limited edition harvest collection, Les Millesimes de Givenchy, in which existing Givenchy perfumes are reformulated with floral harvests of a particular vintage. Each year, they have added three or more fragrances to the range; each collection is based on the prior year's harvest and is dated accordingly (so the 2009 collection appears in the spring of 2010, and so on). To date, the harvest fragrances include Amarige Harvest (2005), Organza Jasmin d'Inde & Very Irresistible Rose Bulgare (2006), Givenchy Les Millesimes 2006 (2007), Givenchy Les Millesimes 2007 (2008), Givenchy Harvest Collection 2008 (2009), Givenchy Harvest Collection 2009 (2010), Givenchy Harvest Collection 2010 (2011). In 2007, Givenchy released Les Parfums Mythiques, a collection of 10 older fragrances, including some that had been discontinued (Le De, L'Interdit, Monsieur, Vetyver, Givenchy III, Eau de Givenchy, Xeryus, Insense, Extravagance d'Amarige & Organza Indecence). 2010: Dance with Givenchy, Eaudemoiselle, Play Summer Vibrations & Very Irresistible Summer Vibrations, Play For Her, Naturally Chic, Ange ou Démon Le Secret Santal d’Hiver & Very Irrésistible Givenchy Cèdre d’Hiver. 2011: Very Irrésistible Givenchy L’Intense, Very Irrésistible Tropical Paradise & Pi Néo Tropical Paradise, Dahlia Noir, Ange ou Démon Le Secret Elixir, Poetry of a Winter Fragrance / Poésie d’un parfum d’Hiver 2011, Le Bouquet Absolu. The Givenchy perfume line can be found at major department stores or online fragrance discounters. In 2010, Givenchy opened a stand-alone boutique at Epcot in Orlando, Florida. See all articles on Now Smell This tagged Givenchy, or take a look at our collection of Givenchy fragrance commercials.